Extruder Screens | Welcome to Hillside Wire Cloth Co. Commonly referred to as wire mesh discs or screen packs have a few uses in different industries, but they are primarily used as a filtering component of the extrusion process. A wire mesh extruder screen is one individual screen of any mesh and diameter. 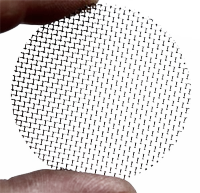 Screen packs are a collection or pack of several different wire mesh discs of varying mesh sizes. Some screen packs have as few as two screens, while others may contain eight or more. Each screen has a different mesh size, providing layers of screening for the product being passed through the screen. Stainless steel is preferred as it is strong, durable, is resistant to rust and maintenance of the screen packs are easy.